Maintaining your Garden Room is paramount to the longevity of the building. The better you look after your Garden Room, the more likely it is to be passed down through the generations. Over the years, I’ve seen all forms of neglect and lost love for these beautiful creatures. 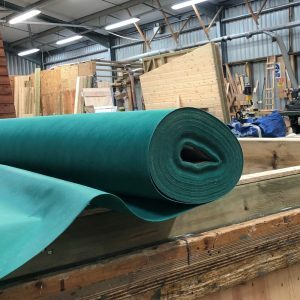 So I thought I’d best help you keep the magic alive, when it comes to your Shedlife, by sharing some top tips. First things first: whatever the external cladding, it’s always best to use some form of treatment on it. At least, to stop the timber from splitting due to UV damage and at best, to protect it against rot and fungi. Gillies & Mackay Blackstone Garden Rooms are clad in tanalised weatherboard as standard – which means they are pre-treated with a pressure treatment before the cladding arrives at G&M. While we’re manufacturing the sections in the workshop, we will apply the first coat of Sadolin (it’s up to you to choose the colour of this). Ultimately, with the weatherboard already being pre-tanalised and then an additional coat of Sadolin applied in the workshop, it doesn’t necessarily need to be treated again for a few years. If you’d like it to be a nice bonny pastel colour or appreciate the finished look – you will want to paint your Garden Room once the assembly is finished. This will give you the opportunity to fill any nail dents and give it a really nice dressed finish. 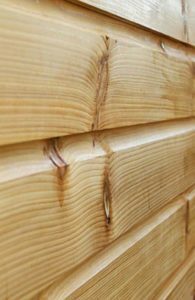 Some alternative Garden Room cladding, like Larch cladding or even just bare tanalised, provide a natural look and will only require a clear preservative to protect it. This is easily applied, with little technique required. Either way, it is vitally important that you continue with a ritual of treating your Garden Room every 5 to 7 years. Sadolin Superdec or Sadolin Quick Dry are the two types of treatment we use at Gillies & Mackay. Secondly: ventilate your Garden Room – let it breathe! It’s all about the moisture. In Scotland, it rains… it rains and rains, and RAINS. 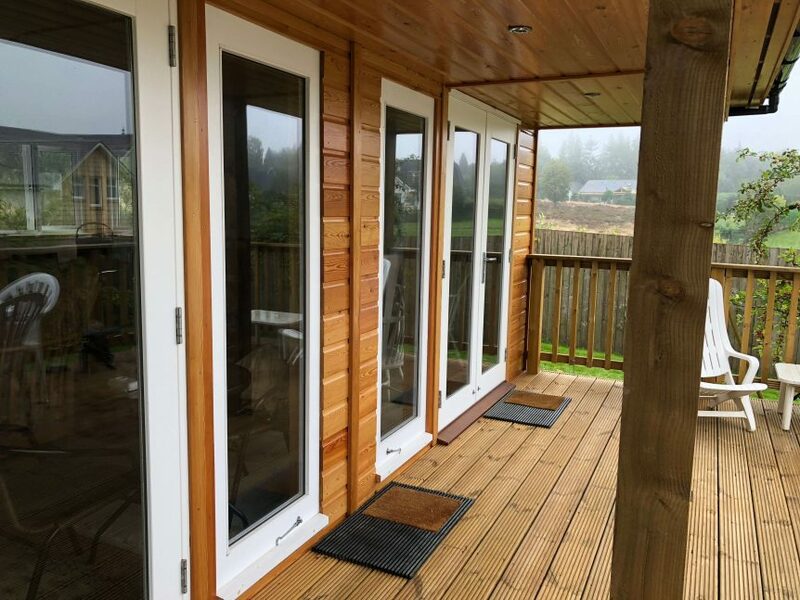 Luckily for Blackstone Garden Rooms, they are made up of 5 layers and, although moisture passes through the external cladding, it will evaporate within the breather cavity. Alternatives to our construction, like ‘interlocking log’, don’t allow this, pulling moisture through to the inside. With your outside wall taken care of, it’s still very important to ventilate the inside to allow any build up of moisture to escape, especially if you’ve been away for a couple of days. Say you’re going on holiday and you have someone to look after the pets or plants, ideally you want them to open up the Garden Room also. This will stop any build up of moisture and keep the building fresh. The other thing you can do is to put in moisture extractors. They’re just little tablets or containers of gel, which you can pick up from any supermarket or DIY store. Last, but not least: I know what it’s like, there’s a million and one things that need doing and we all push the ‘Saturday jobs’ into the next weekend… But little things can become really big things if left unattended. There’s not much that can go wrong with a Garden Room, so that’s why it’s so important to deal with any issues as they arise because – IT’S NOT NORMAL!! Especially if there is a leak somewhere. Water damage can be irreversible, so the sooner it’s fixed the better. Windows and doors: can move, expand and contract, depending on the weather. If yours expand or contract beyond usability then it’s time to do something. Up until that point, it’s better to leave them as they are, as it’s very probable that they will change again in a couple of weeks, weather dependent. Re-roofing: depending on which roofing you have opted for, there will be a time in the distant future, 20 years or more, that you will need to think about re-roofing. This is only a job when it becomes one. Check over the durability of your roof, make sure there are no tears or exposed areas. Only when this happens would you think about re-roofing. If it’s 25 years and the roofing is still completely intact, then do not disturb it. It’s not a great idea to add things to the outside of your Garden Room. Especially things like trellises or window boxes, where plants can then grow up the side of the building. This will cause localised damp spots. Do not, under any circumstances, varnish the inside of your Garden Room as this prevents the timber from breathing. If you wish to stain the inside of your build, use Sadolin or take advice from a reputable decorators’ merchant. You should keep the area around the base of your Garden Room free from weeds and tall grass, as these can conduct moisture to the wall panels. Please prune overhanging trees and shrubs regularly in order to avoid abrasion to the roofing and walls. Should damage to the roofing occur, it must be rectified at the soonest possible opportunity. The doors should be painted on the inside, the top and bottom grains, the hinge side and the lock side (all over), to prevent them from warping or contracting with the elements. They should also be kept shut when not in use. Please be aware that wasps like wood. If they begin to form a byke, this will usually be found in the peak of the building, above the door. It can easily be treated using a proprietary spay such as ‘RAID’. For more information on the removal of wasps visit the BPCA website. Please keep the building aired – particularly in the winter months when it may not receive much use. This helps to prevent the build-up of condensation. We have hundreds of blogs and videos on our website and on our YouTube channel to help you with your #ShedLife. A Garden Room is a once-in-a-lifetime purchase… so it’s worth looking after! There’s very little maintenance required for a Blackstone Garden Room. But please, treat it like your home – clean the gutters, paint the timbers, air the insides and so on. And enjoy your Garden Room for many years to come.